While homes and businesses constructed in this era are still prevalent in many parts of the city, we will focus on the Northwest Side neighborhoods closest to downtown, where they are most at risk. Italianate as an architectural style is common in many of the older neighborhoods of Chicago. One of the characteristics most easily identifiable is decorative hoods over the top of tall and narrow windows, as seen in the above 1868 illustration of Wells School. The style became popular after appearances in architecture pattern books in the middle part of the 19th century and is part of the Romantic Revival family of styles that took inspiration from European architecture of the middle ages. Mail order brackets from The Foster Munger Company, late 1890s. The pattern books showcased high Italianate style in the form of country Italian villas with asymmetrical designs, tall towers, and sprawling wraparound porches. The vernacular style in Chicago built by contractors and builders was frequently a symmetric brick box, accented with trim and finishings from mail-order catalogs based here, such as Foster Munger Company (above). In the years after the Great Fire in 1871, the city began rebuilding commercial and residential buildings much in the same way it had before the Fire. One notable difference was the construction material, as brick and stone replaced wood as the material of choice. At 1029 W. Madison (above) in West Loop, the C.C.P. Holden building constructed in the immediate aftermath of the Fire demonstrates all of the characteristics of the style: large decorative window brackets and elaborate window surrounds. Many of the grand examples of post-Fire Italianate buildings reside in the Loop, where twenty-five have managed to remain in use despite urban renewal and decades of erecting taller and taller buildings. Part of what makes Italianate interesting is its adaptability. From the tallest downtown commercial buildings to Gilded Age mansions all the way to the single-story worker’s cottages, the style crossed many social strata for the availability of use. Architectural ornament of flats and cottages of workingmen were often simpler, yet still often featured intricately carved motifs. The common trait of Italianate homes and buildings, the decorative lintel (sometimes with a decorative hood surround), serves two purposes: function and style. The large decorative stone blocks add an air of importance, as well as charm. Many keystones and lintels have carved motifs such as flowers, vines, and geometric shapes. And while the large keystones and decorative stone lintels are attractive and aid in identifying the era and style, the real value is in durability. The use of large stone lintels or keystones ensures the exterior brick remains intact at the weakest points of a building. The use of large stone blocks above the window absorb weight and pressure and distribute it to the supporting structure around the window openings. A less expensive method of securing window openings is the use of loose steel lintels. While less labor-intensive and less expensive, steel lintels can cause lintel jacking where the expanding steel causes exterior masonry deterioration. The era of the Italianate in Chicago marked an expansion to the lesser settled areas of the Northwest and Southwest sides where land was cheaper and gaining access to the city by way of transit. The blue collar workers of the era had more housing options beyond the crowded tenement housing in the city. The worker’s cottage emerged as a new symbol of this diagonal migration away from the city center. In Chicago, they frequently feature decorative lintels/window hoods and are made of brick. Though the early origins of Italianate as a style were slow to converge and gel, the end of its era was clearly marked. 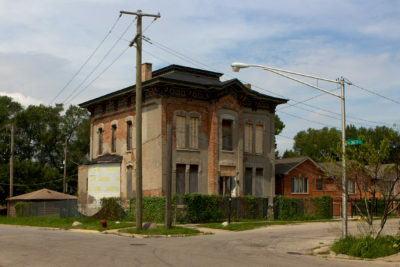 Most of the extant Italianate buildings in Chicago were constructed in the mid-to-late 1880s to the early 1890s, with build dates coming to near halt around 1892. The arrival of the World’s Columbian Exposition packed a one-two punch for the utilitarian yet proud red brick boxes appearing along transit corridors. The immediate halt in new construction was in the form of an economic depression that arrived shortly after the Fair in 1893. The Panic of 1893 not only put a halt to the construction of homes and flats for wage-earners, it was enough to split up what is arguably the most important architectural partnership in history, the firm of Adler & Sullivan. By the time the dust settled and economic activity resumed, the World Fair had achieved Daniel Burnham’s vision as a global tastemaker in design. The Romantic Revival styles of the latter part of the 19th century were replaced by the Classical Greek Revival styles of the Fair. In Chicago, cornice brackets gave way to dentils as the red brick boxes with flowers (above right) were replaced by greystones with palmettes (above left). The style that survived the Great Fire was completely extinguished by economic depression and a resurgence in Classical Architecture. From the period after the Great Fire of 1871 until the Columbian Exposition of 1893, the Northwest Side experienced rapid growth. The dividing line between growth to 1873 and after is marked by the lighter and darker shaded areas, with present-day neighborhoods of Wicker Park and Bucktown in close proximity of post-Fire expansion. Part of this was a result of the Fire and rebuilding farther away from the city, but growth was also fueled by strong immigration and the availability of rapid transit. The neighborhoods which experienced rapid post-Fire growth also saw successive waves of immigrants in a short time span. Many of the early cottages and flats were built by German artisans and craftsmen, later waves saw other western European nationalities take their place. Around the turn of the century, the arrival of Poles became a defining characteristic of the neighborhoods along Milwaukee Avenue, along with Ukrainians a bit farther west. By the late 1960s and early 1970s, Mexican and Puerto Rican immigrants were arriving in large numbers to Wicker Park and Bucktown, often facing discrimination and hardship from long-established residents. Now, decades after these immigrants first established roots and started families and businesses, neighborhoods are again turning over. In some cases, residents are aging and moving on. In others, families are cashing out and selling while the market is red hot and property taxes are increasing rapidly along with rising valuations. A few weeks ago I met Miguel, pictured above. His family moved to the area in 1971, running a corner grocery store and living in the space above it. After about 20 years of running a business that doubled as a neighborhood gathering spot, his family shuttered the store and his dad began a career as a cab driver. Miguel is a living reference guide for area houses and stores now long gone, describing in great detail the families who once lived there and the few who remain. When asked if his family considered leaving as so many others have, he said no. But he did note his father was in his 80s and the family had recently sold a second house they owned. We talked for nearly an hour about the changes he saw as a kid compared to the changes happening now. 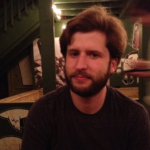 He didn’t seem to have strong negative or positive feelings about neighborhood changes, but he did miss the sense of community where neighbors knew one another and looked out for one another, something lost when a neighborhood turns over. Past generations of neighborhood newcomers adopted the existing housing stock and improved it. The current wealthy newcomers want the amenities, convenience, and charm of these neighborhoods, but show contempt for that charm by knocking down existing homes, many of which were built in the aftermath of the Great Fire. Let’s look at a few cases where flats and cottage buildings on the near Northwest Side that were either recently demolished or will be shortly. Built in the late 1880s, 2429 W. Augusta (above) features a very high first floor and elaborate incised floral window hoods. This proud multi-residential building on W. Augusta sat on the market for only a few days, then sold for nearly $70,000 above the asking price. A pending demolition permit indicates the new owner has plans that do not include rehab. An interesting pattern emerged during the busy summer real estate season, as many teardowns of Italianate cottages and flats will occur on Leavitt. Just a couple blocks from where Miguel lives is a recent scrape that is becoming much more common: a late 1870s cottage razed to make way for a new house costing $1.5 million. 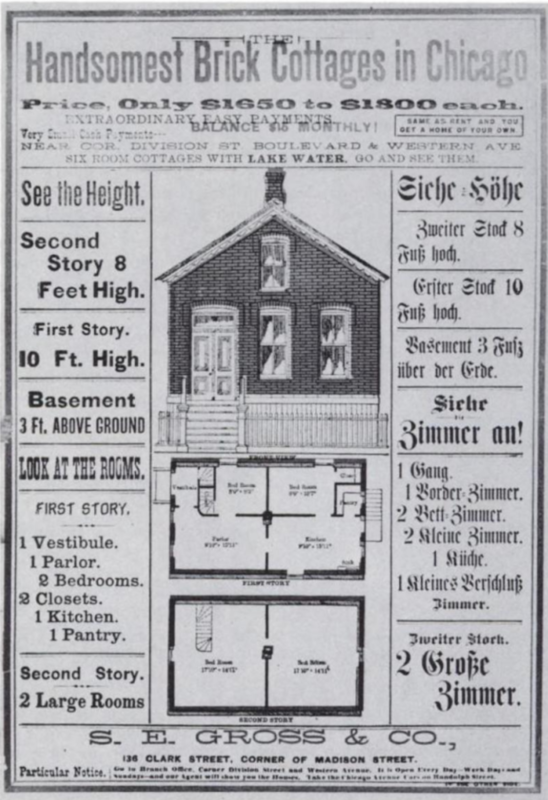 A particularly galling trademark of teardown projects is the advertisement of the new home in the yard of the extant home. 2228 N. Leavitt came down a few weeks ago, with new development by a company with a few anecdotal complaints regarding the quality of construction. Will the new building last 120+ years? Listed at just under $650K a year ago, 1845 N. Leavitt has several sale records since then, most recently in August for $830K to an individual who leads a real estate investment firm. At the time of writing, the demolition permit has not been granted. This demo is a sad case because it’s one of two 1890s identical twin Worker’s Cottages that stand side-by-side. The continuous stone belt course that distributes load above and below the windows became common in the Classical greystones that would replace the red brick Italianate flats in many neighborhoods after the Fair. Advertised as being ideal for SFH or as a duplexed rental on a wide lot, the house sold for $758K and a recent permit reveals that the existing building will get replaced with a new three-flat. At 1437 W. Grand, a mixed-use building will soon give way to a new multi-unit residential building. Though the building was covered with stucco at an unknown date, original features are still visible and give definition. The elaborate cornice detailing, large hipped keystones, and pointed front parapet give this building a small town main street appearance. While a building with more dwelling units is in some cases more ideal, a lot is lost when a mixed-use structure gives way to total residential. When the replacement destroys a building that has stood for over a 130 years, the net result is still a loss, despite the increase in units. What Can Prevent Demolition of Italianate Cottages and Flats on the Northwest Side? Chicago aldermen have enormous say over what gets built and torn down in their wards. Despite this power, they rarely prevent the loss of historic housing stock within it. The more common scenario is a neighborhood group exerting power through planning meetings and on the alderman to impact new development. While these groups may cite historic preservation and character as reasons for opposing a new project, these are usually just mask words for opposition to increased density. Such is the recent case of 2105 W. Caton, where an old though heavily altered and otherwise unremarkable building is heralded as historic, likely because neighbors oppose a project that will offer starter condos in its place. Neighborhood groups rarely, if ever, express concern when architecturally significant buildings get demolished to make way for another structure with similar or less density. While Chicago is fortunate to have a Demolition Delay Ordinance and the context of the Historic Resources Survey, in most cases they are not enough to prevent the loss of historic housing stock. If a building facing demolition is rated “Orange” or “Red” on the Historic Resources Survey, then the demo delay takes effect. But, sadly demolition usually proceeds anyway. One example is 2145 N. Fremont (above) which was built in the mid-1880s and is Orange rated. This rating requires a delay and review process for demolition permit applications. Over the summer it was released from the list, effectively paving the way for demolition, though the permit has not yet been granted. Though successful preservation outcomes are few and far between, an Orange or Red rating in the Historic Resources Survey can aid in efforts to find an alternative to demolition. The mere presence on the list may give pause to a prospective buyer wishing to tear it down, as the permitting process becomes longer and more complicated. Beyond preserving important architecture for future generations, Historic Landmark Districts have a positive impact on neighborhoods in other more tangible ways, including tax incentives and an increase in home values. Landmark Districts are an effective tool for historic preservation but these can be difficult to obtain for larger areas. Individual structures may also be landmarked, though in most cases the current owner would need to consent to the designation.